I just love homemade veggie burgers. These lentil carrot veggie burgers are my latest creation. Actually, my husband came up with these lentil carrot veggie burgers. It’s quite easy with simple ingredients. Homemade veggie burgers are super easy and always taste better than the rubbery veggie burgers you can buy at the store. I always make sure to top my veggie burgers with avocado. It always makes them that much better. Then again, avocados make everything better, don’t they? You could eat these burgers by them themselves, on a bun, or even top a salad with one. Personally, I like mine without the bun and with a side of veggies like my simple roasted broccoli or my maple glazed Brussel sprouts. Yum! This recipe makes a decent sized batch so you will have some left over to freeze. That works out great on those busy days when you have no time to cook. 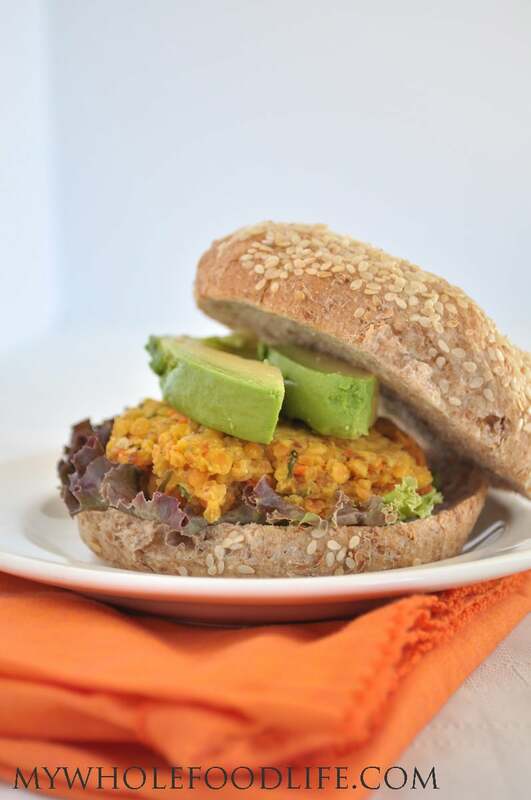 These lentil carrot veggie burgers are vegan and gluten free. I hope you enjoy them. Say goodbye to store bought veggie burgers. This recipe is easy and flavorful! Place all ingredients in a bowl and mix well. You can mash the lentils a little if the mixture seems a little loose. Use a 1/4 cup measurement to make patties. Place the patties on a lined baking sheet . Bake for 30-35 minutes, stopping halfway to flip the patties. Store these burgers in the fridge in an airtight container. They should last a couple weeks. You can also freeze them for longer storage. Enjoy! I love veggie burgers but somehow never think to make them. This version looks really nice. And simple - love that it doesn't have a bazillion ingredients. Sounds delicious! I like the lentils for added protein in the recipe, as I have a very hard training wrestling son. He's always seeking enough protein after those workouts & tournaments! These sound wonderful! Do you think I could substitute Egg Replacers for the eggs? Thanks so much. I love your blog. That might be good too. I love how simple these are. I usually shy away from making veggie burgers because of the time involved, but these look wonderful. Can't wait to try this recipe! Thanks Lisa! I hope you enjoy them!